Nicole's Needlework: On to the Middle! I never did get the boys registered for school yesterday. They are only there Mon. - Thur., so I will go back on Monday. I did get most of their school supplies though. I can't believe all the stuff they need! It's crazy! Anyway, they were happy. And Jake was happy to finally be picking out a lunch box after watching Bradley get one the past couple of years. 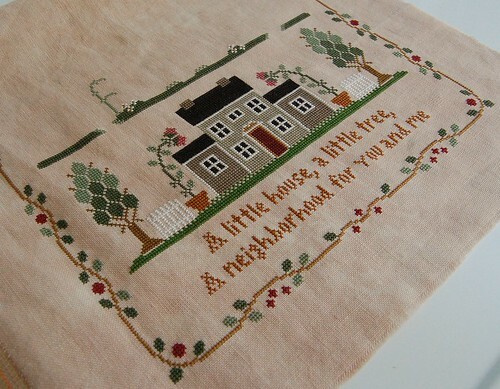 Do you mount your work on anything to stitch are do you hold it and "sew"? Your photos are beautiful and the LHN is shaping up great! Your Neighborhood looks wonderful. You'll have the 2nd level done before you know it. Isn't that the truth about all the school supplies they need. It seems like they need more and more every year. Your Neighbourhood piece looks wonderful, so neat. Your little house neighborhood is really beautiful, I'm looking forward to seeing your progress!